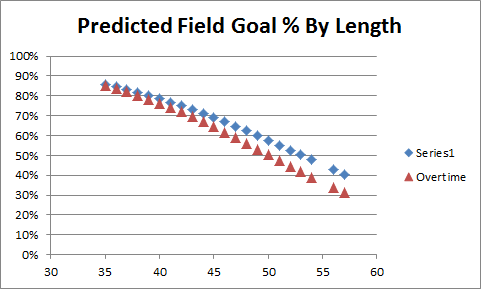 Your conclusion might be strengthened by taking the late 4th quarter field goal attempts from close games and lumping them with the OT attempts. 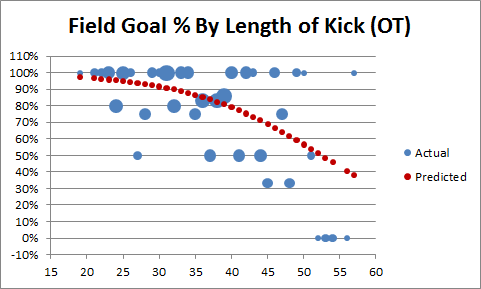 Those data points range from exactly like OT kicks (tie game, last play of regulation) to something more like OT kicks than regulation kicks (close game, less than 3 minutes to go). 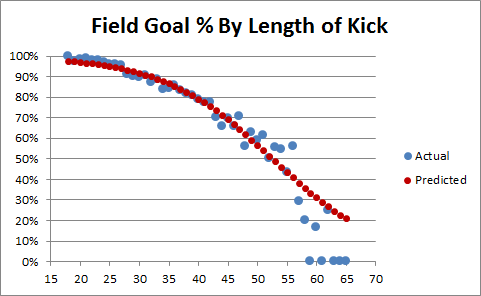 Heck, rough justice could be accomplished just by lumping all field goals with less than 5 minutes to play in with the OT kicks. I’d be interested to see the data broken by quarter, as well. In theory, if the sample is large and fine grained enough, we should see a steady increase in choking as the 2nd half of games moves on (attenuated by the score at the time, of course). Strictly speaking, I’m not drawing any conclusions other than that Keating was incorrect to say that his results were not “statistically significant,” at least by conventional understanding of the term (somehow I think that wouldn’t make as good of a headline). 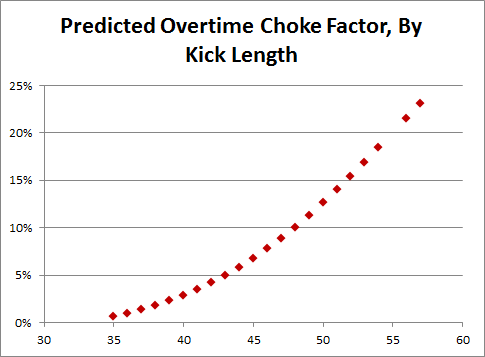 Of course, an actual study of kicking performance by situation could be informative. I’ll keep it in mind. « UPDATE: Advanced NFL Stats Admits I Was Right. Sort Of.